A few weeks ago, we learned that CBS' highest-rated sitcom 'The Big Bang Theory' had a major bit of sitcom history in its corner, as famed comedian and 'Newhart' star Bob Newhart had signed on for a guest appearance portraying one of Sheldon's childhood heroes. Now, the first images of Newhart on set as "Professor Proton" have arrived, while new talk suggests the character could return in the show's seventh season! Get a sneak peek of "The Proton Resurgence" inside! Sitcom legend Bob Newhart will return to his TV roots on May 2, as 'The Big Bang Theory' plays host to the revered comedian for "The Proton Resurgence." Hart will appear as "Professor Proton," hero to Sheldon and Leonard as host of a children's science show, whom Sheldon discovers is available for private appearances. TVGuide obtained the first photo of Hart on the set, as series creator Chuck Lorre explained what drew Newhart to agree to the appearance: "I specified Big Bang because of the writing and the live audience." Newhart also previews potential appearances down the line, as the final scene of the episode "sets it up for me to return a couple more times next season." Perhaps some "Fun with Flags" would be in order? 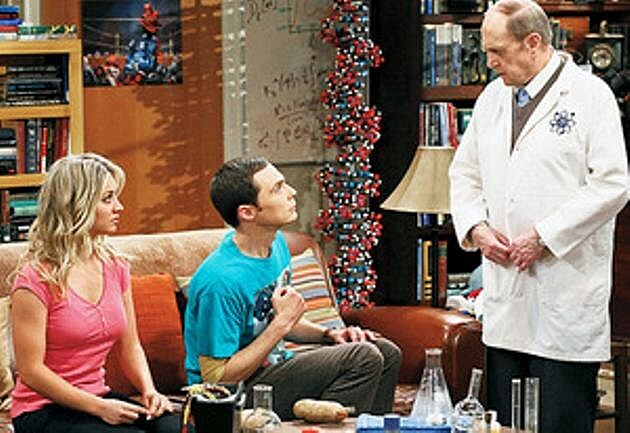 You can check out the first look at Bob Newhart on 'The Big Bang Theory' below, and tell us if you'll watch the May 2 episode in the comments!